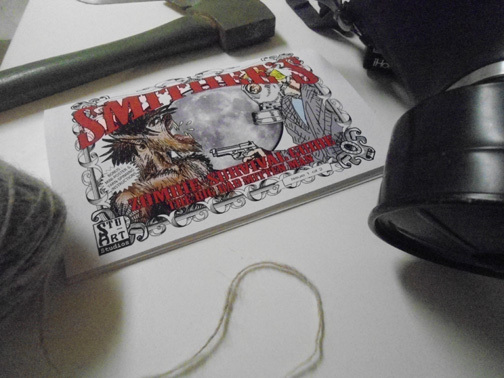 Smithee Zombie Hunter - Buy The Book! Issue #1 is now in print at my Etsy shop. This is the culmination of about 8 months of work from the first cell of me finishing the mitten to creating the print version with additional content NOT in the web-comic version. I print them myself on quality paper for crisp prints and vivid colors on the cover. I have a little secret – Mitten-man Issue 1 isn’t my first foray into printing my own comic. Nope. 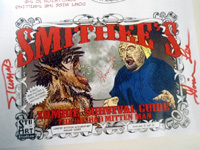 On my Etsy site you will see for sale the real beginning of the Smithee Zombie Survival Guide. The very very first survival guide I did is about taking the B&W pictures in the guide and recombining them to make a full color picture as well as how to do the process yourself from taking the 3 B&W pics to making them into color. This is how color photographs were made before color film came to be. So, it’s very old school. 2. If I was printing comics in the post zombie-apocalyptic world, I would slip in real survival tips for my imagined readers who could really use such information, whitest simultaneously being entertained and their minds taken off their misery.